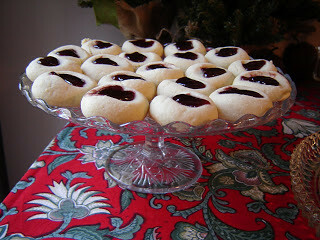 These tender, buttery cookies are bejeweled with sweet and tangy raspberry preserves. 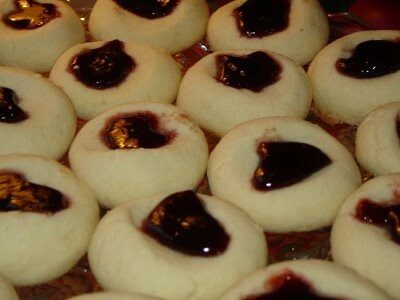 Fresh out of the oven, these cookies melt in your mouth. Just be careful because the preserves will be hot! 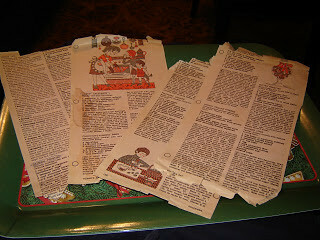 No worries, I’ve typed up all the recipes so that we don’t lose any information to stains or tears! Also, my “Sour Cream Crescents” come straight out of these pages. They are such unique recipes! Cream butter and sugar. Add egg yolks and vanilla and beat until light and fluffy, about 4 minutes. Stir in flour and, if necessary, chill until firm enough to handle. With floured hands, roll in 1” balls. Put 1 and ½ inches apart on cookie sheets. 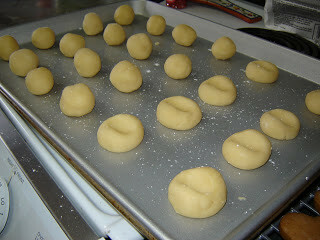 Lightly flour your thumb, and make a small indentation in center of each cookie. 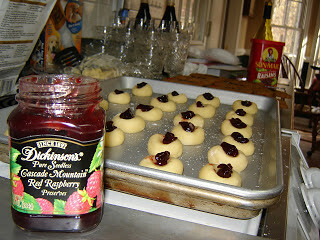 Fill with raspberry preserves. 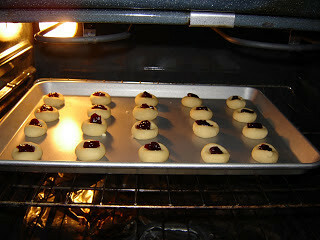 Bake in preheated 325 degree oven about 15-20 minutes. Cool on racks. Makes about 4 dozen. And here is what they look like when they are ready to eat!